Election Tracker LIVE: Congress president Rahul Gandhi Tuesday said his party consulted "big economists" including former RBI governor Rahuram Rajan before it came up with the idea of minimum guaranteed income to the poorest 20 per cent households in the country. Addressing a meeting of his party workers here, Gandhi said Prime Minister Narendra Modi promised to transfer Rs 15 lakh to every bank account. "We thought it was a good idea...Rs 15 lakh in bank accounts. But the promise was not fulfilled by Modi. We started our work six months back to make such a thing reality," he said. He went on to say that his party consulted "all big economists, without telling anyone, without giving any speeches". Delhi BJP Releases New List of Probables | The BJP's Delhi unit has prepared a fresh list of 31 probable candidates for the seven Lok Sabha seats in the national capital, and has included the name of former cricketer Gautam Gambhir in it. An earlier list of 21 probable candidates shortlisted by the election committee of the state BJP was turned down by the party's top leadership, which sought "more representative" nominations for final selection of candidates for the seats in the national capital. "Ten more names have been added to the new list and the earlier names have been retained. It will be sent to the national leadership very soon," said a top leader of BJP's Delhi unit. Varun Gandhi Thanks PM | BJP MP Varun Gandhi on Tuesday thanked Prime Minister Narendra Modi and party president Amit Shah for declaring him the party's candidate from Pilibhit, which has traditionally been his mother Maneka Gandhi's Lok Sabha seat, and said that he had a "familial bond" with the place. The BJP announced candidates for 39 more seats for the Lok Sabha polls and swapped constituencies of the mother and son, putting to rest all speculation over Varun's fate. Maneka Gandhi will fight from Sultanpur which he had won in 2014. 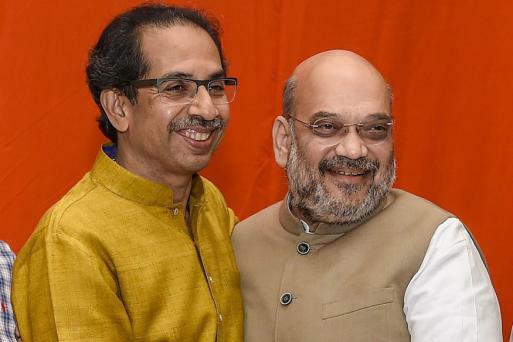 The Shiv Sena has announced MP Rajendra Gavit as its candidate from Palghar in Maharashtra for the upcoming Lok Sabha elections. The Election Commission is learnt to have decided to seek details of remarks made by Niti Aayog vice-chairman Rajiv Kumar in which he had attacked Congress over minimum income guarantee promise. Sources in the poll panel said, since Kumar is part of "bureaucratic executive", such remarks may be violative of the model code. 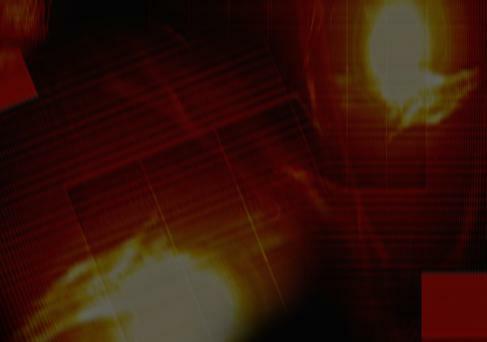 "It is not a case of one politician attacking the other or one party attacking the other," said a functionary. "We were engaged in this work for six months. Take the list of all big economists of the world, we consulted them...Raghuram Rajan...one by one," Rahul said. "First thing, we we came to know was that there should be a minimum income line. We calculated and the result was that the minimum income line should be 12,000 per month," he said. Gandhi said his party will fulfil the promise. On Monday, Gandhi had announced in New Delhi that Rs 72,000 per year will be given as minimum income to poor families, benefiting around 25 crore people, if his party is voted to power in Lok Sabha polls, and asserted it will be the final assault on poverty. Gandhi had said 20 per cent or five crore families belonging to the poorest category with monthly income less than Rs 12,000 would come under the scheme. Consulted Big Economists on Minimum Income Scheme: Rahul | Congress president Rahul Gandhi said his party consulted "big economists" including former RBI governor Rahuram Rajan before it came up with the idea of minimum guaranteed income to the poorest 20 per cent households in the country. Addressing a meeting of his party workers here, Gandhi said Prime Minister Narendra Modi promised to transfer Rs 15 lakh to every bank account. "We thought it was a good idea...Rs 15 lakh in bank accounts. But the promise was not fulfilled by Modi. We started our work six months back to make such a thing reality," he said. He went on to say that his party consulted "all big economists, without telling anyone, without giving any speeches". Patel, who recently joined the Congress, has sought a stay on his conviction in order to contest the upcoming Lok Sabha elections. The Gujarat High Court was set to hear the case on March 26, but was forced to adjourn it by a day after the government lawyer did not turn up for the hearing. What Next for Hardik Patel? | The electoral debut of Patidar quota leader Hardik Patel remained in limbo after the Gujarat High Court on Tuesday adjourned the hearing of a petition seeking a stay of his conviction in a 2015 rioting case in the state. The case will now be heard on Wednesday. The CPI wrote to the Election Commission on Tuesday alleging that the government is indulging in "surrogate advertising" through institutions like Khadi India. Modi replaced Mahatma Gandhi as the face of Khadi India in 2017. The Communist Party of India (CPI) also alleged that the brand selling khadi jackets as 'Modi jackets' amounted to promotion of the prime minister. "This is to bring to your attention that government is indulging in surrogate advertising through various government institutions like Khadi India," CPI General Secretary S Sudhakar Reddy said in the letter. Talking about the biopic of PM Modi, the Bengal chief minister Mamata Banerjee said that if someone wants to make a picture in their own favour,let them do it. However, she said, such actions before elections become questionable. On LK Advani being dropped from BJP's list of candidates, TMC chief Mamata Banerjee has said that Advani was the 'actual mentor' of BJP. "I am feeling bad. The BJP has forgotten the old days as new leaders are coming up," Banerjee said, adding that not letting the senior leader contest the polls was an 'insult' to him. However, Banerjee said that Advani should not leave the party as he been with it since the beginning. BJP Fields Candidate with 11 Criminal Cases in Bengal | In a state where political parties have traditionally refrained from fielding bahubalis, 33-year-old BJP candidate from West Bengal's Coochbehar Lok Sabha seat, Nisith Pramanik, stands out with the dubiousdistinction of as many as 11 criminal cases against him. Samajwadi Party Tuesday declared list of its three candidates including Anand Sen from Faizabad Lok Sabha seat. The party has announced Anand Sen from Faizabad, Hemraj Verma from Pilibhit and Devendra Yadav from Etah as its candidates, a party spokesman said here. The party had earlier declared list of 20 candidates including one from Madhya Pradesh. SP patron Mulayam Singh Yadav is contesting from Mainpuri, party president Akhilesh Yadav from Azamgarh, Dimple Yadav from Kannauj, Dharmendra Yadav from Badaun, Akshay Yadav from Firozabad, Mohd Azam Khan from Rampur. Azam Khan had once ensured Jaya Prada's victory from the Rampur seat, which is dominated by the family of Rampur Nawabs. 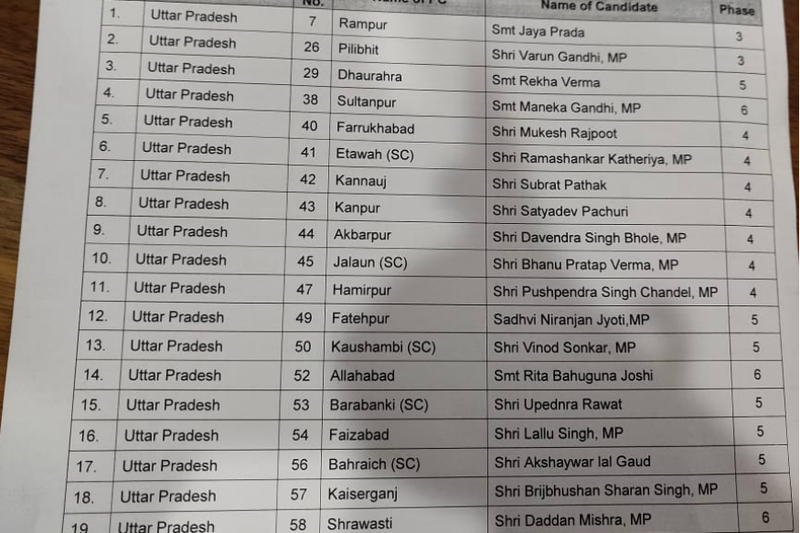 The BJP released its list of 39 candidates for Uttar Pradesh where the Lok Sabha elections will be held in seven phases, starting April 11. Satyadeep Pachauri has replaced Murli Manohar Joshi from the Kanpur Lok Sabha seat. Actor Jaya Prada, who joined the BJP earlier in the day, has been fielded from Rampur. 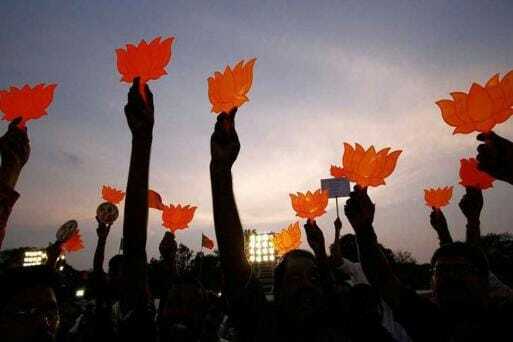 BJP has declared its list of candidates for Uttar Pradesh for the upcoming Lok Sabha elections. "Akhilesh contesting the polls from Azamgarh will help in the consolidation of 'lathi, hathi and 786' voters," SP Azamgarh district chief Havaldar Yadav said, referring to the Yadavs, Dalits and Muslims. "His presence will boost the poll prospects of SP-BSP alliance candidates in the entire eastern UP region as Azamgarh lies between Gorakhpur and Varanasi,"he said. "With 'netaji' (Mulayam Singh Yadav) as MP and Akhilesh as CM, the constituency witnessed development and people here acknowledge it," Havaldar said. The seat is at present held by SP patriarch Mulayam Singh who won the 2014 polls from Mainpuri and Azamgarh. He retained Azamgarh to ensure the presence of the party in eastern UP. Samajwadi Party chief Akhilesh Yadav's decision to contest from his father Mulayam Singh's bastion Azamgarh is being touted as a move to consolidate the Yadav, Dalit and Muslim voters in the Purvanchal region of Uttar Pradesh. The Samajwadi Party is contesting the upcoming Lok Sabha elections in alliance with the Bahujan Samaj Party (BSP) and Rashtriya Lok Dal (RLD). Taking a swipe at PM Modi for failing to provide Rs 15 lakh to every citizen, Congress chief Rahul Gandhi said that the Congress would be implementing a minimum income guarantee scheme . He termed the decision as 'historic'. I deliver what I promise, like I did in Rajasthan, Chattisgarh and Madhya Pradesh. we promised them loan waiver and implemented it after coming to power," Gandhi said. "If Narendra Modi can give the money to rich, we can do it for the poor," Rahul Gandhi said, adding that the Congress would do a 'surgical strike' against poverty. Dubbing the GST as 'Gabbar Singh Tax', Rahul Gandhi said: "Modi took all the money from the people of the country and gave it to Nirav Modi, Mehul Choksi and others. That was not enough then he brought 'Gabbar Singh Tax," Gandhi said. PM Modi Doesn't Understand MNREGA: Rahul Gandhi | Accusing the PM Modi of weakening and opposing the schemes, like MNREGA, that helped the poor, Congress chief Rahul Gandhi said that the PM does not udnerstand it. "MNREGA gave jobs to crores of people in the country. In last 5 years, Modi has opposed and weakened all the schemes that helped the poor. He referred to MNREGA as "digging pits". He doesn't understand that these schemes lifted 14 crore people out of poverty," Gandhi said. Congress chief Rahul gandhi is addressing a rally in Rajasthan's Bundi where he said that the Prime Minister wants to divide the country in two parts. " On one hand there is Modi and RSS, on the other there is Congress and you people," Gandhi said. "We were engaged in this work for six months. Take the list of all big economists of the world, we consulted them...Raghuram Rajan...one by one," he said. "First thing, we we came to know was that there should be a minimum income line. We calculated and the result was that the minimum income line should be 12,000 per month," he said. Gandhi said his party will fulfil the promise. West Bengal chief minister Mamata Banerjee has hit out at the BJP for side-lining veteran leader Lal Krishna Advani. “Advani was the actual mentor for BJP. They have forgotten old days because of the new crop of leaders. But old is gold. It is an insult to him. But this is my personal feeling, they may not agree to it,” she said. Veteran BJP leader Murli Manohar Joshi was on Tuesday also dropped as a BJP candidate for the Lok Sabha elections, while Union minister Maneka Gandhi and her MP son Varun Gandhi swapped their seats as the party announced its 29 more nominees from Uttar Pradesh. BJP general secretary Arun Singh announced that Union minister Manoj Sinha has been fielded from Ghazipur, a seat he had won in 2014, and UP government ministers Rita Bahuguna Joshi and Satyadev Pachauri from prestigious Allahabad and Kanpur seats respectively. Joshi, 85, had won from Kanpur in 2014 but was told by the party leadership that he would not be fielded in the coming elections. The party has not given the ticket to veterans like L K Advani, B C Khanduri and Kalraj Mishra among others. Actor politician Jaya Prada was fielded from Rampur hours after she joined the party Tuesday. UP BJP president Mahendra Nath Pandey has been repeated from Chandauli, Singh said. Maneka Gandhi will contest from Sultanpur and Varun Gandhi from Pilibhit. Congress chief Rahul Gandhi today hit back at the BJP and PM Narendra Modi over the criticism of his minimum income guarantee plan, and said Modi had mocked MGNREGA, too, and failed to understand Congress government's employment generation scheme. Addressing a Jan Sankalp Rally in Bundi, Rajasthan, Gandhi said once Modi gave a speech in Lok Sabha and claimed no one benefited out of MGNREGA. “He couldn’t understand what it is all about,” the Congress chief said. “MNREGA gave jobs to crores of people in the country. In last 5 years, Modi has opposed and weakened all the schemes that helped the poor. He referred to MNREGA as ‘digging pits’. He doesn't understand that these schemes lifted 14 crore people out of poverty,” he said. Gandhi assured those in attendance that he would deliver on his income promise, and said people can check his record. “What I promise, I deliver. Same was done in Rajasthan, Chhattisgarh and MP, where I promised farmers loan waiver. As soon as our government came into power, I did that,” he said. Actor-politician Shatrughan Sinha, who is all set to quit the BJP and join the opposition alliance in Bihar, showered praise on Rahul Gandhi, calling him the "master of situation" and his proposed minimum income guarantee scheme--'NYAY' a "masterstroke". Gandhi said the proposed income scheme of the Congress was the party’s “surgical strike” on poverty, even as he attacked Prime Minister Narendra Modi for lobbying for industrialists. Addressing a rally in Rajasthan, Gandhi said, “The Prime Minister says ‘Main Chowkidar Hoon'. He didn't say whose chowkidaar he is. Have you seen a chowkidaar at a farmer's home? Have you seen a chowkidaar at the home of an unemployed youth?” The Congress chief will speak at the Khel Sankul Ground in Bundi and later in the evening, address the Shakti Booth Workers Meeting at Ramleela Ground in Jaipur. Meanwhile, the Nishad Party today became the fourth constituent of the Gathbandhan in Uttar Pradesh as it joined hands with the Samajwadi Party for the upcoming Lok Sabha elections. Veteran actor Jaya Prada joined the Bharatiya Janata Party and said she had pledged her life to the service of the party. Political parties have swung into action as today is the last day of filing nominations for the second phase of polling. So far, the BJP has released nine lists for the upcoming Lok Sabha elections, while Congress announced its eleventh list of candidates on Monday. In a boost to N. Chandrababu Naidu’s efforts to cobble together a federal front, several national leaders will join the TDP’s election campaign in the coming days. Today, National Conference chief Farooq Abdullah will participate in election campaign along with Naidu. Abdullah will address public meetings in Kadapa and at Allagadda in Kurnool district. The opposition parties will also address a presser on demonetisation at 1pm which will be attended by leaders across political parties. Congress General Secretary for eastern Uttar Pradesh, Priyanka Gandhi Vadra will visit Amethi and Rae Bareli on 27th and 28th March and Ayodhya on 29th March. Meanwhile, UP CM Yogi Adityanath will campaign in Varanasi, Prime Minister Narendra Modi’s Lok Sabha constituency. Union Defence Minister Nirmala Sitharaman will launch the election campaign of BJP candidate Kummanam Rajasekharan in Thiruvananthapuram today. Sitharaman will inaugurate the campaign of the party candidate, who was also former governor of Mizoram, at E K Nayanar Park, Putharikkandam, at 5pm. The Minister will also inaugurate the election committee office of BJP at PRS Krishna, Ambuja Vilasam Road, at 4pm.